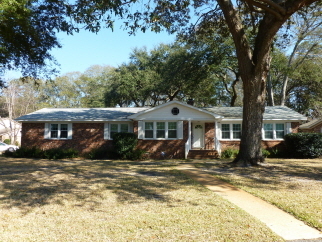 Sandhurst is an established West Ashley neighborhood that is close to everything. You can be anywhere in Charleston County within minutes.....I-26, downtown Charleston, MUSC, The Citadel, Charleston Air Force Base, airport, shopping, schools, St. Andrews Family Recreation Center....within walking distance of the new award winning Orange Grove Elementary charter school (must apply for enrollment). Sandhurst residents enjoy riding their bikes and walking their pets on the wide (some tree lined) streets. And best of all, NO REGIME FEE here!! The Sandhurst association meets annually. The HOA is a voluntary $10 YEAR. Great place to live. Interior Features Well maintained, one level, solidly built, ONE OWNER, brick home in Sandhurst, one of Charleston's most sought after neighborhoods. Greet your guest in the welcoming tiled foyer. Formal living room which adjoins the formal dining room and makes for easy entertaining. Kitchen features new dishwasher. Spacious breakfast area in kitchen. The den is enhanced by a brick fireplace (gas logs) and features sliding glass door overlooking patio. Mostly smooth ceilings, and newly re-finished hardwood floors in most of house . Exterior Features Double garage with storage area. Thermal windows 3 years old. Roof 5 years old. Moisture control system in crawl space. Additional Features and Amenities The back yard is fenced, with mature landscaping. Sandhurst is an established West Ashley neighborhood that is close to everything. You can be anywhere in Charleston County within minutes.....I-26, downtown Charleston, MUSC, The Citadel, Charleston Air Force Base, airport, shopping, schools, St. Andrews Family Recreation Center.